We have a new guest in our household for the next few weeks. 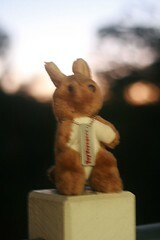 I’m very pleased to introduce you to “Skippy Kangaroo” who is a Toy Voyager. 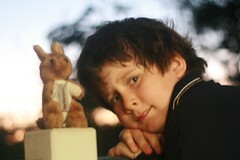 Skippy plans to travel the world, meet someone famous, see lots of different animals, and climb a palm tree. Quite a lot of ambitions for such a small toy! 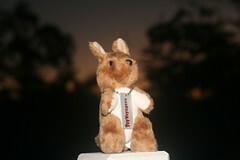 Rather than tell you about Skippy, I thought would let our intrepid explorer talk to you directly. Over to you, Skippy! I arrived in Queensland today and will be spending a few weeks with my new hosts. As soon as I escaped from the padded postbag, I wanted to explore this strange new place, so I bounced up stairs to the deck and watched the last rays of the sunset with Harrison. There’s another furry creature here, Bella. She’s a maltese shih-tzu cross doggie, who tells me she’s very glad I am here. Apparently, Bella was getting tired of being the smallest animal in the house, and told me that it’s my turn to get picked up and hugged by Lilly all the time. “I try to look pleased when Lilly picks me up all the time”, Bella confided to me, “but sometimes I find myself muttering ‘Oh no, not again!'”. I heard some possums chattering outside last night while everyone else was asleep. 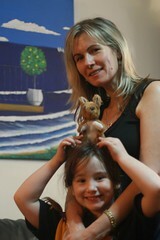 Bella tells me the local possums are very naughty, and have a party every night outside her room. She yips at them but they just call her names and laugh at her. Today, we’re all going geocaching. I promise I’ll show you some photos when we get back. Neilius tells me he’s going to try to introduce me to a travel bug, so that we can talk about our adventures. 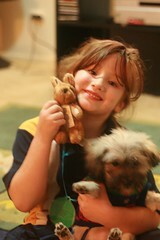 I’m so glad Sara (my owner) rescued me from the Salvo’s! Who would have thought I’d be a jetsetting little toy with so many people who love me! >I have move lots of travel bugs. This is the first I’ve heard of Toy voyaging. Very interesting.